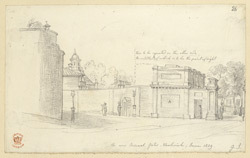 This delicate pencil sketch depicts the entrance to the Royal Arsenal at Woolwich. There is evidence that a community has existed at Woolwich since the Iron Age. In 1512 Henry VIII chose Woolwich as the centre of shipbuilding for the newly formed Royal Navy. The area that was later to become the Royal Arsenal was first used as a storage facility for ammunition. The extensive, marshy ground was found to be ideal for military exercises, as it helped deaden the sound of explosions. The Military Academy appeared in 1741 and was in much use over the next 200 years, particularly during the Crimean and First World Wars. In WWII the area became a popular target for the Luftwaffe and consequently suffered heavy bombing.